Rotherham recorded their biggest win at the New York Stadium as Notts County slumped to the foot of League One. The Millers were 4-0 up inside 30 minutes, with James Tavernier curling in a free-kick for the opener. Fellow Newcastle loan signing Haris Vuckic doubled the lead before Alex Revell's strike and Kieran Agard's penalty as good as ended the game. Vuckic added a second after the restart following a storming run and Tom Hitchcock completed the rout. County should have led early on, but Kwesi Appiah just failed to turn home Jamal Campbell-Ryce's cross. The defeat is a sixth in seven games for the Magpies, while Rotherham have now won seven and drawn two of their last nine to raise hopes of an automatic promotion challenge. "I'm not happy with the first 15 minutes, of course. It seemed we were a bit tired. "We've got some wonderful, talented players as we've always said and we showed our class. "It was as good an afternoon as we could have had. "We showed today that we have a squad of players and not just individuals." Match ends, Rotherham United 6, Notts County 0. Second Half ends, Rotherham United 6, Notts County 0. Corner, Notts County. Conceded by Adam Collin. 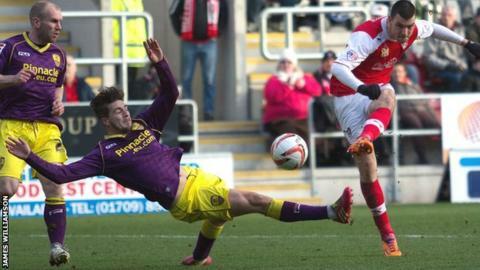 Hand ball by Nicky Adams (Rotherham United). Attempt saved. Michael O'Connor (Rotherham United) right footed shot from outside the box is saved in the top centre of the goal. Hayden Mullins (Notts County) is shown the yellow card. Foul by Hayden Mullins (Notts County). Corner, Rotherham United. Conceded by Manny Smith. Attempt blocked. Nicky Adams (Rotherham United) right footed shot from outside the box is blocked. Kieran Agard (Rotherham United) wins a free kick in the attacking half. Corner, Notts County. Conceded by Craig Morgan. Attempt blocked. Kieran Freeman (Notts County) right footed shot from outside the box is blocked. Alan Sheehan (Notts County) wins a free kick in the attacking half. Foul by Tom Hitchcock (Rotherham United). Goal! Rotherham United 6, Notts County 0. Tom Hitchcock (Rotherham United) left footed shot from the centre of the box to the bottom left corner. Assisted by Nicky Adams with a cross. Corner, Rotherham United. Conceded by Kieran Freeman. Corner, Notts County. Conceded by Michael O'Connor. Corner, Notts County. Conceded by Joe Skarz. Jack Grealish (Notts County) is shown the yellow card. Substitution, Rotherham United. Tom Hitchcock replaces Haris Vuckic. Attempt missed. James Tavernier (Rotherham United) right footed shot from outside the box is just a bit too high from a direct free kick. Michael O'Connor (Rotherham United) wins a free kick in the defensive half. Foul by Kyle Dixon (Notts County). Substitution, Rotherham United. Nicky Adams replaces Ben Pringle. Haris Vuckic (Rotherham United) wins a free kick on the left wing. Foul by Kieran Freeman (Notts County). Substitution, Notts County. Tyrell Waite replaces Callum McGregor. Attempt saved. Alex Revell (Rotherham United) right footed shot from the centre of the box is saved in the centre of the goal. Substitution, Rotherham United. Michael O'Connor replaces Lee Frecklington. Attempt saved. Callum McGregor (Notts County) left footed shot from outside the box is saved in the centre of the goal. Goal! Rotherham United 5, Notts County 0. Haris Vuckic (Rotherham United) left footed shot from the centre of the box to the top left corner. Assisted by James Tavernier. Hand ball by Jamal Campbell-Ryce (Notts County). Jack Grealish (Notts County) wins a free kick in the attacking half.